Nervous about being the best man? Don’t worry, it’s completely normal, especially if you’ve never done it before. There’s a lot of best man responsibilities for you to take care of. Perhaps the most nerve-racking part of your best man experience is getting up to perform a speech in front of all the guests. Fear of public speaking is one of the most common fears in people, we see it all the time at Blush Banquet Hall. The best thing you can do to overcome this is to be prepared and write a great best man speech. Keep reading for some of our pro tips. Alright, so you’re the best man and that’s great, but no one wants to listen to you for 15 minutes. It’s important to pay attention to how long your speech is. Try and keep your speech length to about five minutes and not much more than that. Five minutes should be more than enough time to tell the bride and groom how you feel about them and to get your jokes and stories in there. The easiest way to express your relationship with the groom to the crowd is to tell a short story in the speech. Maybe it’s about how you two met, or perhaps how he helped you out in a tough situation. Whatever it is, this is one of the ways you’ll be able to draw the crowd in on a personal level. Just make sure you’re not telling any risque or inappropriate jokes to the crowd. There’s no need to bring up ex-girlfriends or drunken nights. It’s inappropriate, and the groom, bride, and their family won’t appreciate it, no matter how funny you think it is. 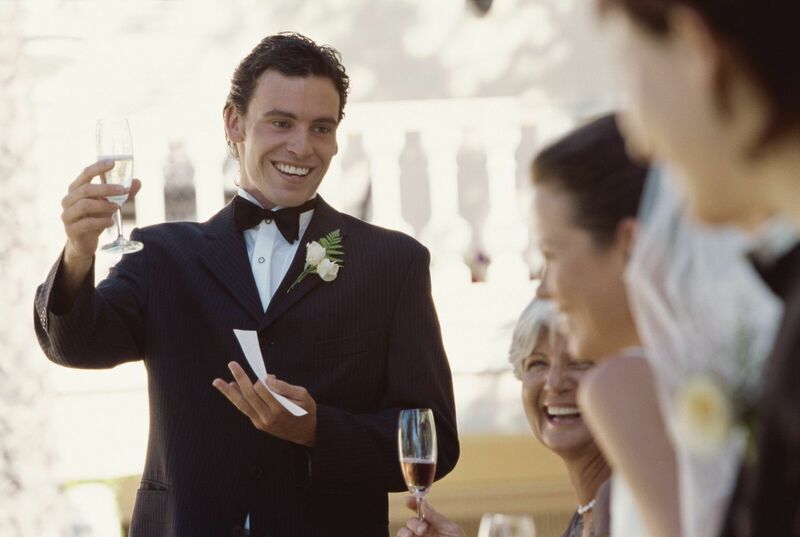 You’re going to want to weave a joke or two into the best man speech to try and keep the audience with you. A great speech has a certain flow to it and incorporating a joke or two in between stories will keep the audience listening. Avoid some inside jokes that only four people in the crowd will understand. You’re going to want to stick to a more general joke or two that everyone can understand and laugh at. Just as you’re avoiding risque stories, you’ll want to do the same when telling a joke. There’s no need to bring up how you almost set the room on fire during your last Vegas trip. Keep your jokes strictly about the groom and avoid any jokes about the mom and dad or their family. You don’t want the family to be upset at you. You’re going to want to score some points here with the bride and her family. Take the time to talk briefly about your relationship with the bride and how you’ve seen the groom change for the better since being with her. You can talk about what it was like when you first met her and how the groom was always talking about “this girl.” Make it heartfelt and show her how much she means to you and the groom. We get it, you’re not a speech expert. Not many people are. That’s why it’s important that you thoroughly prepare beforehand so you don’t look like a nervous wreck up there. Spend time practicing your best man speech in the mirror. You do not want to get up there and read completely off of your note cards. The worst thing a speaker can do is to look down at note cards and not make any eye contact with the crowd. You don’t need to have the speech completely memorized word for word, but try not to constantly look at your notes. If you need to briefly glance down, that’s not a problem, just don’t do it 30 times. Don’t be fake when writing your best man speech. People can tell when you’re coming across as disingenuous. Be heartfelt and you’ll see the crowd listening intently. 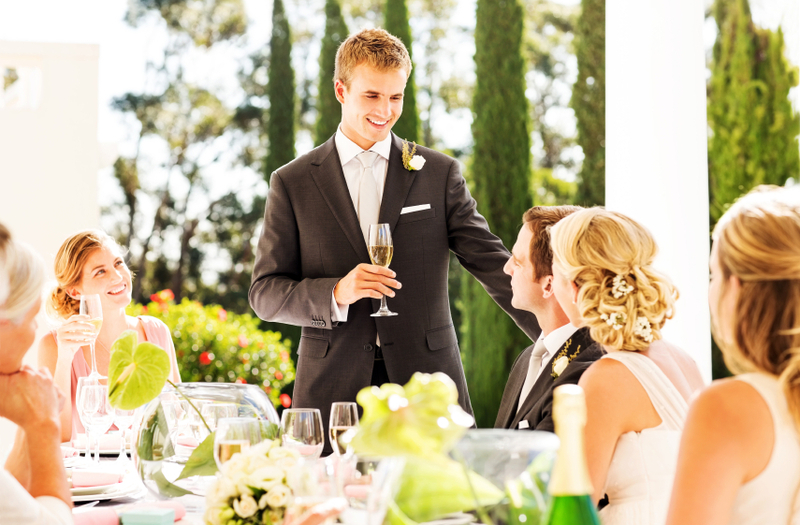 If you’re looking for inspiration, there are plenty of best man speech examples online. Don’t be afraid to pick pieces from those to get your creative juices flowing.